Vespa small frame casings: Square stud pattern, two transfers, intake has two studs until the PK range. Intake is located above the swingarm on the crank side casting. Transfers are hard to enlarge for kits without welding. Vespa 150 Super casings: Square stud pattern, two transfers, and the first autolube system. These cases are almost identical to VBB & VBA casings. A third port can be cut in the top of the casing mouth. 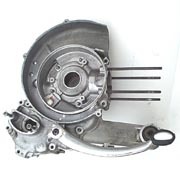 The major difference to P series 150cc casings is the flywheel side main bearing and oil seal.